End Of The Week Winter Storm Looming. 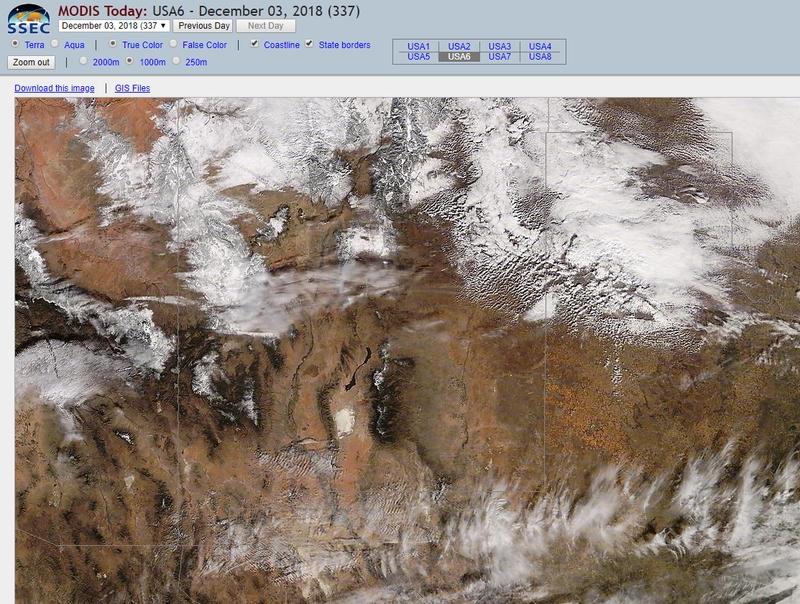 3:36 PM MST Saturday, December 1, 2018. More photos via this link. The Sierra Blanca Snotel reports that 9" of snow is on the ground this Monday afternoon. Our next winter storm will add to this total Thursday into early Saturday morning. 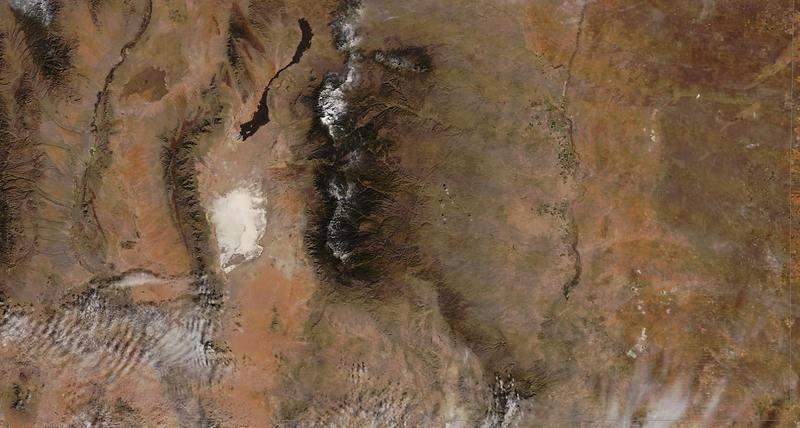 Snow can clearly be seen on the ridge tops of the Capitan and Sacramento Mountains in today's visible MODIS Satellite images captured above. Next Winter Storm Impacts Thursday And Friday. 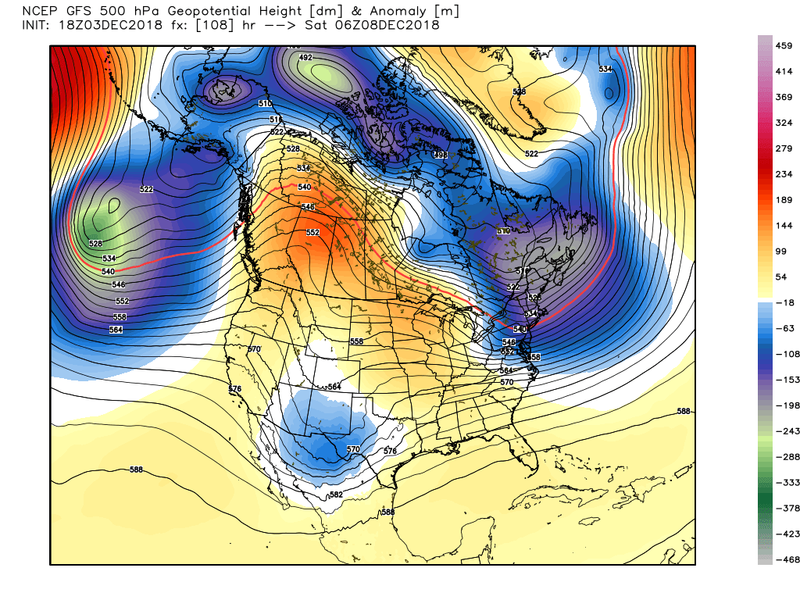 U.S. GFS 500 Millibar/18,000' Mean Sea Level Analysis. 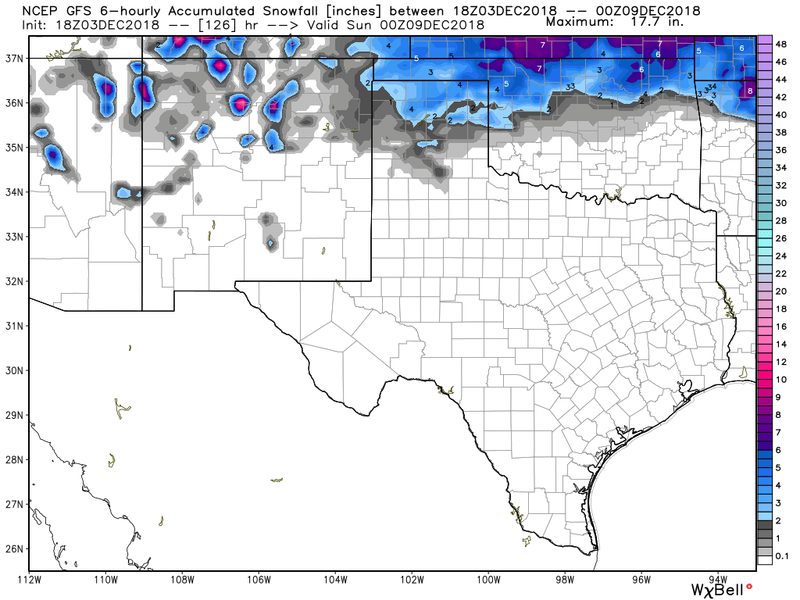 Valid At 11 AM MST Monday, December 3, 2018. 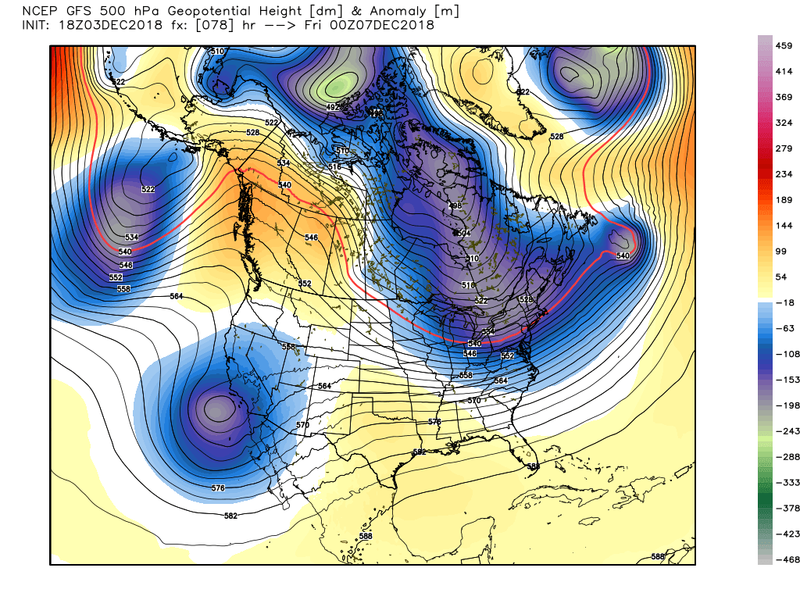 U.S. GFS 500 MB Forecast. Valid At 5 PM MST Thursday. Valid At 11 PM MST Friday Night. Our next "bowling ball" or closed mid level low was located well west of the northern California coast near the noon hour today. This winter storm is forecast to drop southeastward and be located roughly west of San Diego by around sunset Thursday. 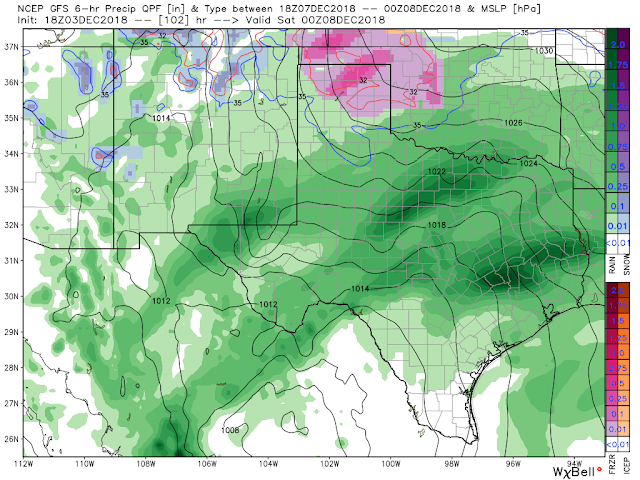 As it ejects eastward across northern Mexico Thursday night into Friday night it is forecast by the U.S. GFS model to be located southwest of El Paso by around midnight Friday. U.S. GFS Temperature Anomaly Forecast. Valid At 5 PM MST Friday Evening. 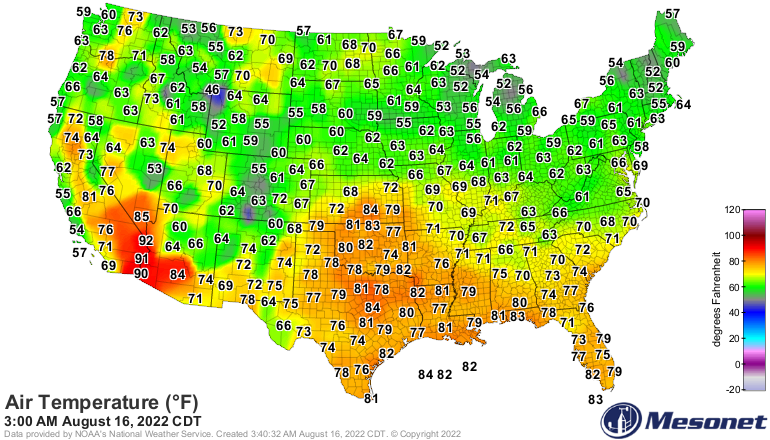 U.S. GFS Forecast High Temperatures. A backdoor cold front is forecast to slide southward and westward down the Eastern Plains and into Southeastern New Mexico on Friday. It will be a shallow colder air mass so it won't have a lot of umph to push west of the Sacramento and Guadalupe Mountains. 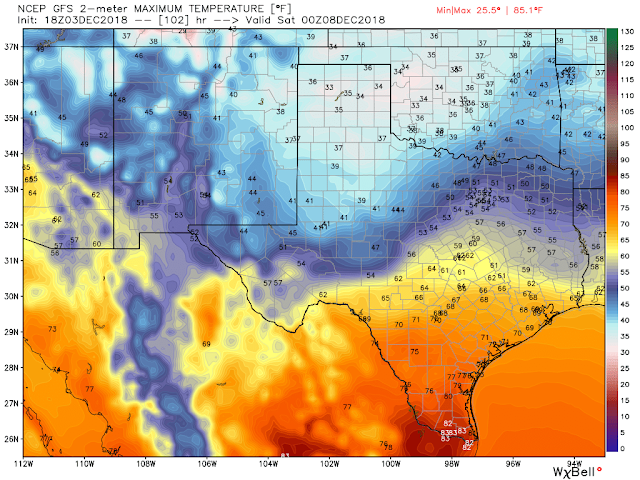 For now it appears that our high temps across Eastern and Southeastern New Mexico will be in the mid 30's to the mid 40's on Friday. 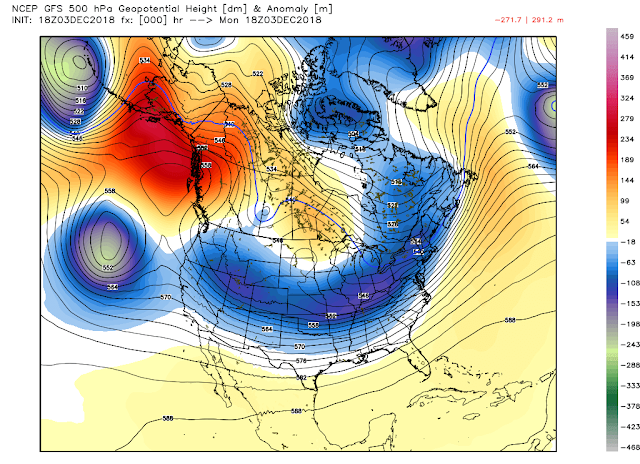 Valid At 5 PM MST Saturday. Compared to some of the other forecast models the U.S. GFS model is the warmest of the set today. So it may not be accurately forecasting the extent and coverage of the mix of rain, freezing rain, sleet, and snow that is expected across Eastern and Southeastern New Mexico and parts of West Texas Thursday night into Friday night. This also includes the current forecast for snow across the Capitan, Sacramento, and Guadalupe Mountains. Compared to recent storms this inbound winter storm will be warmer than its predecessors thus snow levels will start out around 10,000' on Thursday, lowering down to around 7,500' to 8,000' by Friday evening. 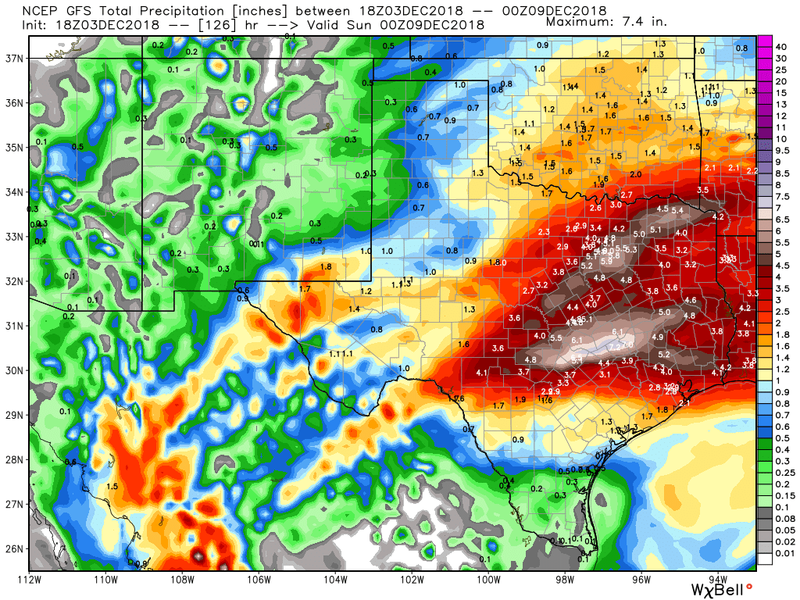 U.S. GFS Total Rainfall Forecast. 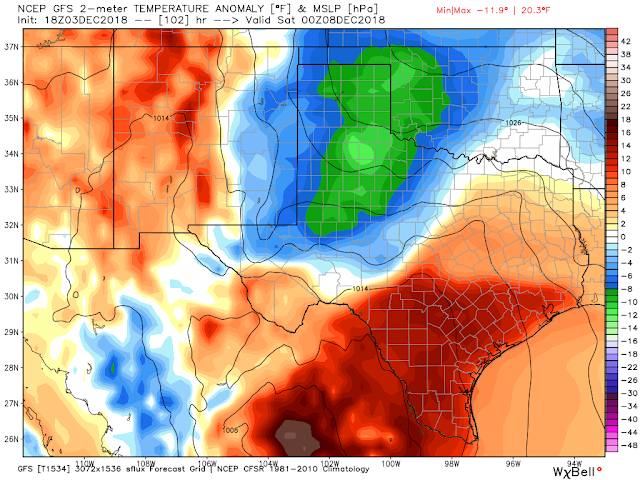 Valid t 5 PM MST Saturday. This next incoming winter storm is a complex storm with lots on uncertainties at the moment. This one will be a wet one with the potential for significant rainfall totals across parts of the lower elevations of the local area. Heavy mountain snow are possible above 8,000' as well. More on this evolving storm in a couple of days.